This short piece is intended to explain recent developments in Irish politics to overseas readers who may be a little confused by the rapidly changing situation. Blogging about Irish politics at the moment is a difficult task. Anything you write is liable to be out of date before you hit the “Publish” button. As the title of this piece suggests, I had originally intended to write about Brian Cowen (“Biffo”) resigning* as leader of Fianna Fáil, the largest party in our ruling coalition. But soon after I began writing the piece I took a break to make a sandwich. I switched on the TV to be greeted by a news report informing me that we no longer have a ruling coalition. Certainly there’s a grim fascination in watching the fools and charlatans of our political class dig themselves and the nation into ever deeper and darker holes. Chaos creates spectacle after all. But after a while it just starts to become depressing. The entire political structure is rotten to the core and those who speak loudest of reforming it are those who work hardest to reinforce it. Despite resigning as party leader, Cowen will remain Taoiseach (Prime Minister) until the General Election. Earlier in the week, he announced the election would take place on March 11th. Mind you, he also announced his intention to lead Fianna Fáil into that election. Two years earlier, he announced that the Irish Bank Guarantee would not cost the taxpayer a single cent. Then he spent a couple of years announcing that his government would not request a “bail out” from the IMF/EU. An announcement he was still reiterating three days before his government requested a “bail out”** from the IMF/EU. 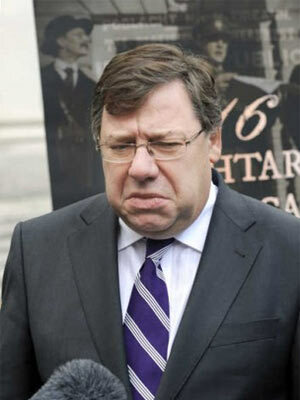 Needless to say, there’s nobody left in the country willing to place their faith in the announcements of Brian Cowen. Which is probably why, almost immediately after announcing his intention to lead his party into the election, he was faced with a Fianna Fáil vote of no-confidence in his leadership. A vote that, weirdly enough, he won. Scratch that. It’s not very weird at all. Given the staggering lack of ideas in modern Irish politics, it doesn’t surprise me that even within the framework of a secret ballot, Fianna Fáil TDs chose to support a completely discredited leader rather than consider the possibility of change. Heaven forbid they should have to engage in independent thought! Not that it mattered. Within hours of Cowen winning the confidence vote and — theoretically — the support of his party, the resignations began. About a third of his cabinet resigned and Cowen attempted a reshuffle. This point is a bit murky and some reports have suggested he demanded the resignations as punishment for those who had been briefing against him in the run up to the confidence vote. Remarkably though, the reshuffle failed when his erstwhile partners in government, The Green Party, blocked the reappointment of new ministers. The Greens are facing electoral meltdown as a result of their limp participation in arguably the most disastrous government in modern Irish history. Not unreasonably, they feared the public might be further annoyed by Cowen promoting a bunch of his friends to the cabinet, and a hefty ministerial pension, for the six short weeks before the lot of them get kicked out by the electorate. And they didn’t want to be associated with such a cynical maneuver. If they think a death-bed conversion is going to help them at the polls they’re sorely mistaken. The time for the Greens to leave government was the night in September 2008 that the unlimited Bank Guarantee was made. And I seriously doubt the Irish people will forgive them for that failure. Anyway, with Cowen unable even to appoint minsters to his own cabinet, he had clearly lost the ability to lead his party — let alone the nation. He limped on for another couple of days until the Greens gained the courage to make a decision. Over two years late and only after they’d been backed into a corner, the party I voted for — the party who claimed to represent me — finally found its voice. And what a pathetic squeak of a voice it was too. Holding a Press Conference at a luxury Dublin hotel, the Greens announced that they were resigning from government but would still vote with the government on the imminent Finance Bill. Such courage! Such conviction! To relinquish the trappings of power a full month before being ousted, but only after pledging to continue supporting the financial and economic policies of Brian Cowen’s government. See, the Finance Bill is due to pass through the Dáil and the Seanad (the houses of parliament) over the next week or two. In effect it provides the legal framework for the “bail out”. It rubberstamps the debt transfer from private into public hands and will be remembered as the most obscene piece of legislation in the history of our republic. By withdrawing from government but not from the passage of this Bill, the Green Party merely highlight their craven complicity in this most dishonourable of betrayals. Rarely has a democratically elected government so dramatically sold out those they claimed to represent. So what happens next? Well, the Finance Bill will be passed over the next 7 to 10 days and the government will be dissolved immediately afterwards. The election date will be brought forward from March 11th and will now occur some time in the latter half of February. Fianna Fáil will suffer their worst ever defeat at the polls (maybe even a terminal one) and be replaced by a Fine Gael government, perhaps in coalition with the Irish Labour Party. This will not represent a substantial change. The faces will be different but the policies, attitudes and vision will remain the same. In the longer term though, the Irish people simply cannot support the level of debt being heaped upon us by those we appointed to run our affairs. We will default on this debt; be under no illusions about that. I just hope it happens sooner rather than later… before our pension reserve fund and few remaining national assets are syphoned off into the bottomless pockets of a diseased international financial system built on blood and greed. I’ll write more about the evolving situation and the impending election over the next few weeks. Stay tuned. * let’s face it, it was a “resignation” in name only. He was ousted, albeit two years late. ** I think it’s important to place scare quotes around “bail out” to constantly remind ourselves that what’s happening is, in a very real sense, the opposite of a bail out. Or rather, it is a bail out, but it’s the Irish people doing the bailing as opposed to the official line which paints us as the recipients of aid. Massive debts were incurred by private financial institutions and the transfer of those debts onto the shoulders of the Irish taxpayer is certainly a “bail out” (with quotes) as opposed to a bail out (without quotes). Let me reiterate a point I have made on several occasions because it is of supreme importance… what is happening in Ireland at the moment is a massive expropriation of public assets by the institutions of private capital. And anyone who imagines that — should they be permitted to get away with this crime — those institutions will stop at Ireland, is a naive fool. As a result of ecological mismanagement and impending resource constraints, free market capitalism has begun to collapse. And like a thieving guest, it is filling its pockets with whatever valuables it can get its hands on before the party’s over. You’re next folks. Wherever you live, you’re next. And if the governments of the world aren’t willing to intervene and put a stop to this robbery in Ireland, then at the very least learn from what’s happening here. One response to "Bye Bye Biffo"